Congratulations to Bert Roest! His new book “Franciscan Learning, Preaching and Mission c. 1220-1650” has just come out with Brill. For more information see the publisher’s website. For Nicholas Everett, the future of medicine may lie in the past. Everett is an Associate Professor in the University of Toronto’s Department of History and an expert in the history of medicine. He argues that many ancient and medieval treatments, which were often mixtures of plants, minerals and animal products, were neither ineffective nor placebos — although he admits a few were lethal. Everett has been busy uncovering practices that might spark new medical research. In 2012, he published The Alphabet of Galen: Pharmacy From Antiquity to the Middle Ages. The book is an English translation, with critical notes, of a Latin text that describes almost 300 traditional medicines and why people used them. 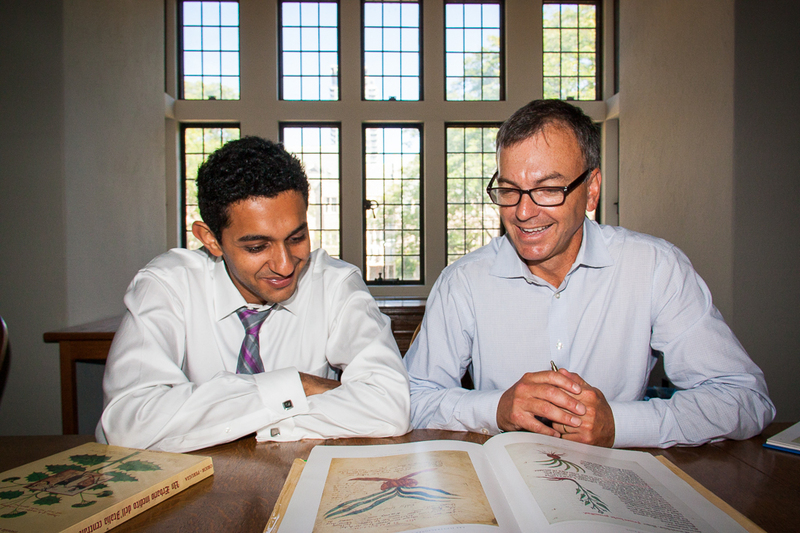 And this summer Everett and Martino Gabra, a graduate student in the Department of Pharmacology and Toxicology, published a paper that describes the chemical composition and probable effects of a medieval medicine called the “Great Rest,” which included opium, henbane and mandrake. The pair calculated the likely effective dose and toxic dose for the popular sedative. The study represents the first assessment of a medieval drug using the principles of modern pharmacokinetics, which measures how the body processes drugs. Gabra says the idea that henbane can temper morphine abuse could be useful to researchers today, and that the history of medicine offers many possible avenues for new research. He and Everett plan to apply their approach, which they’ve dubbed “historical pharmacology,” to other medieval and ancient treatments. Gabra also hopes their methodology will aid another coming area of research: how plant-based dietary supplements and food interact with drugs. Many plant ingredients react with drugs and food to adversely affect health. For example, chemical compounds in grapefruit juice can change the activity of blood-pressure medications. Ginseng can increase bleeding in people taking aspirin. Everett continues to step outside his discipline as well. He registered for a B.Sc. at U of T in 2011, and has taken several life sciences courses. He says the course work has confirmed his belief that humanities scholars can reap huge benefits from studying science — and that medicine has a lot to learn from the humanities. *Shapiro, Arthur K, and Elaine Shapiro. The Powerful Placebo: From Ancient Priest to Modern Physician. Baltimore: Johns Hopkins University Press, 1997. Print. Patrick Breternitz: The Collectio Herovalliana – A canonical collection from Boniface’s circle? Zinaida Uzdenskaya: Thomas Beckett – an Ideal Martyr. Studies in the Iconography of Canterbury Pilgrim Souvenirs. Sponsors: Faculty of Arts and Science, Centre for Medieval Studies, Department of Germanic Languages and Literatures, and Pontifical Institute of Mediaeval Studies, a.r.t.e.s. Graduate School for the Humanities Cologne. In 2014 the Dictionary of Old English (DOE) welcomed its new staff Chief Editor, Roy M. Liuzza, and new Drafting Editors, Rob Getz and Stephen Pelle. Continuing the work of the DOE is a great privilege and a great challenge, and support at this time is an expression of confidence in the scholarly mission of the Dictionary. In 2013, the DOE was awarded a $500,000 five-year Challenge Grant from the Triangle Community Foundation of Raleigh, North Carolina. The grant requires a 1:1 match to release funds to the project. Thanks to the generosity of hundreds of individuals and institutions, we were able to raise $100,000 to release the first instalment of funds in 2014. Our goal now is to raise another $100,000 to match next year’s grant. Support is especially welcome at this time, when each donation, no matter how large or small, will have twice the impact. Your gift will help to ensure that the DOE will reach completion and will serve scholars and lovers of the English language for generations to come. Donations may be made online through credit card, or a pledge form is available to facilitate donations by mail; please make your cheque out to “DOE/ University of Toronto”. Tax receipts will be issued for all gifts.